I'm in Brooklyn, on my way back to Sydney after a meeting in Princeton. 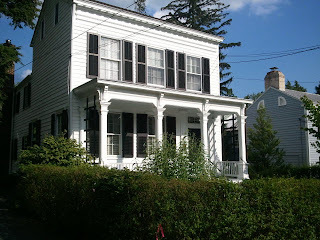 I'll mention the meeting a little more below, but when in Princeton, all those with an interest in physics should make a little pilgrimage to a small while house just off to the side of campus. It's address is 112 Mercer St. The house is interesting as it is where Einstein lived from 1936 until his death in 1955. Einstein's office was not on the main university campus (which is a rather beautiful and surreal place) but at the Institute for Advanced Studies which is just a little further down Mercer St.
Einstein's house is a pretty little wood house on a street of pretty wood houses, and doesn't stand out too much. Interestingly, Einstein did not want the house turned into a museum, and so it is still a private residence, with the current householder being Eric Maskin who, while not being a physicist, holds a Nobel Prize (in Economics). A very quick post today, as things are busy (more about that in a little while), but seeing the above quote at Steinn Sigurðsson "Dynamics of Cats" blog reminded me about something about physics education (and science in general). I've mentioned before about my thoughts on physics education. Traditionally, this is split into two separate bits, the analytic mathematically bits in lectures, and laboratory work. People who do more of one than the other label themselves are theoreticians or experimenters. They are portrayed as living in different worlds. The problem is that this completely misrepresents science. Science is the interface between these two, it is an extremely vital component, and we do an extremely poor job of highlighting how important this is. The Physics of "Rendezvous with Rama"
While I read science fiction, I don't read a lot of it. I prefer history books (and while the 6th June was focused on the transit of Venus, it is famous for another big historical event). I'm not a fan of "magic" science fiction, where the equivalent of a magic wand is waved, with some pseudo-scientific gobbledygook, to fix a problem. So, I am going to talk about a book that doesn't, namely Rendezvous with Rama by Arthur C. Clarke. I'll start with two confessions. Firstly, I don't really like a lot of Clarke's work. And second, I didn't actually read the book; I had it read to me. Back in Sydney after a couple of nights in the lovely Port Stephens, in the town of Shoal Bay at the ASA Early Career Research Workshop. 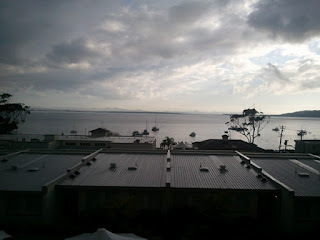 Here's the grey sky as seen from my hotel room (it may be grey, but it's a lovely place). I should point out, with 17 years under my belt since my PhD, and being a professor at a large university, I am not an Early Career Researcher, and so I was there as a grown-up, providing advice and live stories. I spoke on the topic of networking, something that sounds horribly business-world-like, but is an important aspect of establishing a career. There were a lot of postdocs there, many recently out of their PhD, but a few in their third postdoc, all with the question of "How do we get that career in astronomy?"